Malaga airport has installed a Cessna 421B Golden Eagle from 1992, which had been abandoned. 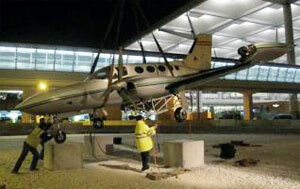 The Malaga Air Transport Museum has restored the piece and instead of placing it in the museum, the Cessna is installed on the new roundabout next to the T3, which is a very attractive spot for the eight seater airplane. Specifically, it is situated between the terminals T2 and T3 and passengers using the mobile gangway from the airport parking may see it in its entire splendor. The Museum of Airports and Air Transport of Malaga is the only museum of its kind in Spain.